SAM 24 H.O. 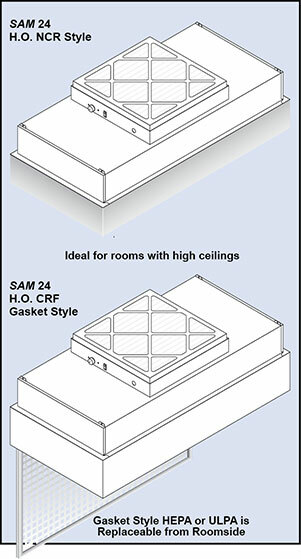 Series Fan Filter Units are ideal for cleanroom applications with high ceilings. SAM 24 H.O. Fan Filter Units are designed to deliver up to 1000 CFM, and include a 100mm 99.99% efficient HEPA filter, 2” prefilter, seismic clip suspension points, solid state variable speed control with RFI suppression, and a safety switch. The energy efficient N310 motor blower is a low watt, backward curved impeller, single phase, permanent split capacitor type motor blower assembly with thermal overload protection. Units are available in 115 Volt (60 Hz), 208-230 Volt (50/60 Hz) and 277 (60 Hz). The HEPA 100mm final filter is protected with a white epoxy diamond pattern grille and is tested according to accepted procedures as described by the Institute of Environmental Sciences (IEST) and or ISO standards. 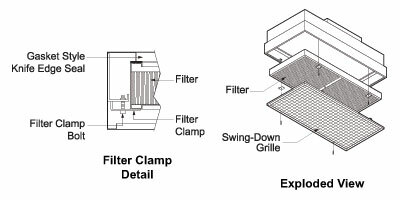 CRF units feature a polystyrene eggcrate grille in an anodized aluminum frame hinged to open, permitting removal of the HEPA or ULPA filter without removing the unit from the ceiling. Popular options include an 8’ power cord (115 Volt only), 99.9995% eff. ULPA grade final filter, UL 900 filters and duct collar adapters. Refer to the back of this section for more options and accessories. 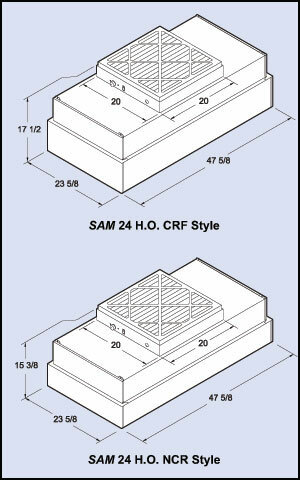 CRF Style Filter Data: Size: 20-5/8” x 44-5/8” x 6” with anodized aluminum frame and diamond pattern white epoxy face screen. The HEPA Filter with 100mm media is designed for 145 FPM average face velocity @ initial 0.40 w.g. and has a rated efficiency of 99.99% @ 0.3 micron or larger. An access port with removable plug is located in the center of the filter element face and is used for introducing an upstream challenge or measuring static pressure. NCR Style Filter Data: Size: 23-5/8” x 47-5/8” x 6” with exposed anodized aluminum frame and diamond pattern white epoxy face screen. The HEPA Filter with 100mm media is designed for 145 FPM average face velocity @ initial 0.40 w.g. and has a rated efficiency of 99.99% @ 0.3 micron or larger. Standard Equipment: Includes a N310 Low Watt motor, prefilter and a solid state variable speed control with RFI Suppression. A safety switch is provided for all voltages as listed below. Options: ULPA Filter, Power Cord, Duct Collar Adaptors. More options are shown in the back of this section.